From the author of StrengthsFinder 2.0, How Full Is Your Bucket?, Strengths Based Leadership, and Wellbeing comes a transformative book and online application that will improve your health for years to come. 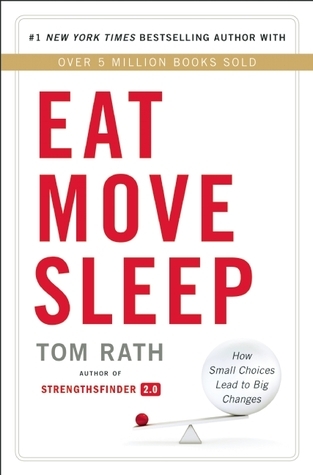 While Tom’s bestsellers on strengths and well-being have inspired more than 5 million people in the last decade, Eat Move Sleep reveals his greatest passion and expertise. Quietly managing a serious illness for more than 20 years, Tom has assembled a wide range of information on the impact of eating, moving, and sleeping. will move a lot more than you do today. And you will sleep better than you have in years. More than a book, Eat Move Sleep is a new way to live. Everyone knows, like this book says, that we need to eat right, move more, and sleep better. This book will help you do that. I pretty much liked everything the author had to say. One of the things I agreed with was that some people sleep better with a constant noise in the background. This is 100% true for me. I can’t sleep with no noise. Silence is so loud in my head that it drives me nuts. Because of that, I’ve been sleeping with a fan at the foot of my bed since I was a young child. Every night. When the electric goes off, I immediately wake up and can’t go back to sleep until it comes back on. I’ve tried many times over the years to sleep without a fan…just can’t do it. My husband hates my fan as much as I hate his snoring. Rath also says that “Every Meal Matters” and I know this is a fact for me. For years I didn’t eat breakfast or lunch and by the time supper rolled around I was starving. And then I’d overeat. Even now I may not eat lunch everyday, but I rarely ever miss breakfast. And eating breakfast has helped me shed a few pounds. Included in the book is info about going online to eatmovesleep.org and create a personalized Eat Move Sleep plan. I haven’t checked this out yet, but plan to. There’s also a “First 30 Days Challenge” in the book and you can also download a PDF of the challenge at the link above. One of the tips he gives is to eat the healthiest foods first. He says his daughter loves pasta and would eat that first, then only have room to eat some of her vegetables. Instead of taking the pasta away, he told her she could have it after she ate all her veggies. Now she finishes her vegetables, and doesn’t always have room for all the pasta on her plate. I haven’t tried this yet, but will. I think that’s a great tip! One of the things I’m going to try is going to bed the same time every night and waking up at the same time every morning. I’m so bad at that. I tend to go to sleep and wake up whenever I feel like it…reading in bed has nothing to do with that though :). Rath says there was a 3 week study where the participants had different sleep/wake up times. Their glucose when haywire. So I’m thinking my sleeping habbits may be contributing to my high blood sugar numbers. If so, that’s an easy fix to help bring my numbers down. What I didn’t like was that he sometimes said things over and over. And while I liked reading the “statistics”, not all of them were backed up as much as I’d have liked. I decided to read this book on the recommendation of Joy @ Joy’s Book Blog, and is the second of four books I read for her New Year’s Resolution Reading Challenge, and am glad I did. I can’t wait to add some of the things in the book to my daily fitness plan. Cool! I’m glad this worked so well for you. Lots of great ideas, here, that I want to try as well! Thanks for recommending it Joy!